Listen up, oily-skinned ladies. Can you not wear foundation, because it cakes up as your oil seeps out of your skin throughout the day? Has no foundation, primer, or combination of both been able to keep the grease-beast under control? I know this was me for years, and I worked in beauty! I’ve got your solution, and it’s something I guarantee you have already. Now, don’t roll your eyes at me just yet. Yes, I know everyone already knows about these. I found they were great for a midday shine fix, but nothing actually prevented oil from lifting my foundation off of my skin as the day wore on. Here’s the tip. Don’t save the blotting papers for that lunchtime touch up. Use them before you even put your makeup on! After you complete your entire skincare routine (which I’m sure you do, right???? ), let your products sink in. Grab a coffee. Watch a little TV. Have a dance party. Your choice. Then use blotting papers to get rid of any oil from your skin or skincare products (yep, they can be the culprit!). Don’t be stingy. Really sop up all of that oil. Now apply your primer, foundation, and concealer as you normally do. Your skin with be more matte for way longer. I guarantee it. You might not even need primer, to be honest. Additionally, I should mention that you should resist the urge to apply tons and tons of powder to set your makeup. I thought I could get away with whisking a tad (or a ton) more powder on my face because I get to so oily in my T-zone. What could be the harm? It’ll absorb the oil and mattify, right? Wishful thinking. As you produce oil, the powder will cake up. I recommend using a big fluffy brush, or even a fan brush if you tend to be heavy handed like myself, and dust a light amount of clear setting powder all over your face. If you use colored, foundation powder, it could change color as it interacts with your skin and oil as the day progresses, resulting in a cakey mess. Just brush a light amount of powder to set your hard work. You’re good to go! Bring a few blotting sheets in case you’re really an oil slick, but, trust me, your makeup is going to hold up like a DREAM throughout the day. 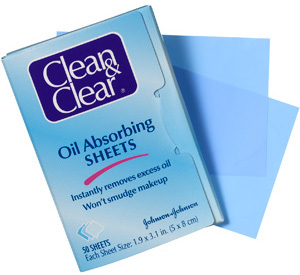 My favorite oil-blotting papers are, no joke, Clean & Clear Oil Absorbing Sheets. Not only are they the cheapest, so you can use as many as you want, but each sheet actually absorbs more oil than the rice paper sheets from more expensive brands like Boscia or Tatcha.